Though you may not realize it, the external siding on your house is just as integral to the building’s structure as the roof. Siding protects the inner frame from damage and also provides insulation so that your home stays warm in the winter and cool in the summer. While a couple of cracks and holes in your siding may seem trivial, the home building experts at Somers, MT-based Helke Construction are here to tell you that they need to be fixed right away. Unfortunately, small signs of damage rarely ever stay small. If you find out that chunks of your siding have fallen off or rotted through, leaving the damage alone just gives it more time to get worse and thus become more expensive to fix. Once there is an opening into the structure of the house itself, leaks can occur when it rains or snows, and both your electricity and air conditioning can seep through, causing huge amounts of energy waste. If the holes are big enough, small critters like mice or squirrels might even wriggle their way inside. 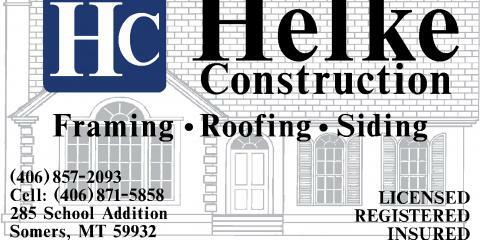 The moment that you notice your siding needs to be fixed, contact the home builders at Helke Construction. With an A+ rating from the Better Business Bureau, Helke Construction is a trusted company both locally in Somers, MT and in the surrounding areas. They use nothing but the best materials and always stick to the agreed-upon price quote once they have given it. Quick to finish any job, they will never make you feel as if you are wasting either your time or your money. If you want to get started on a new home construction project, call Helke Construction today at (406) 857-2093 or visit their website for more information about their business and all of the services they provide. Should You Replace the Roof When You’re Selling Your House?